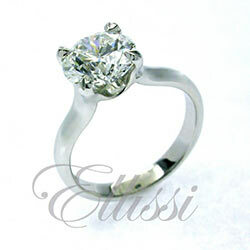 The “Oliva” engagement diamond, 4 claws holding a 1.01 ct D/SI1 EX EX EX main diamond. The 18 ct white gold band on this ring has a further 12 round brilliant cut diamonds channel set in the shoulder of 0.04 pt. 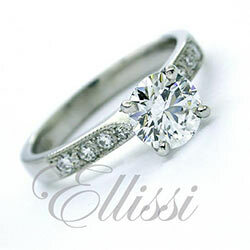 This gives the ring “as shown” a total diamond weight 1.50 ct. Shoulder diamonds used were E/F VS+. 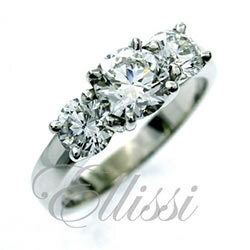 Various options are possible in this style when it comes to diamond selection.